Of all the great cars to bear the Ferrari name, none are as much loved or as widely respected as the classic V12 road cars built between 1948 and 1989. Their stunning performance was matched by the equally stunning beauty of their hand-crafted coachwork, which came from the finest carrozzerie in Italy and occasionally elsewhere. Ferrari had set out as a maker of sports and racing chassis but soon realised that there was a ready market for roadgoing versions of their cars as well. For the bodies, they turned to Italy's specialist coachbuilders, who rose magnificently to the challenge. They created the best of the best, for those who could afford it and who had the taste to appreciate it. 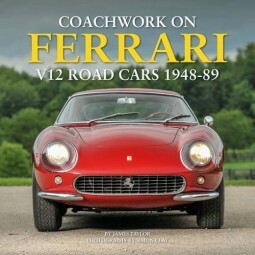 This book dwells on the coachwork created for the V12 road cars, examining the main types produced by each of the major carrozzerie as well as some less well-known examples. It traces the story of what gave Ferrari road cars their visual appeal from the early days, when Farina, Ghia, Touring and Vignale were the favoured coachbuilders, and when each body was hand-crafted to individual order. As the 1950s wore on, the company's allegiance changed to Pininfarina, which went on to dominate the production of Ferrari bodies. Meanwhile, some customers continued to demand individual designs, and a selection of those is included. The coachbuilders are presented in alphabetical order, with a brief introduction to each company's history, personalities and activities, followed by a gallery of photographs of their creations, with extensive explanatory captions. Accompanying the overall exterior views are shots of interiors, facias, and of trim details inside and out. There are more then 370 photographs, the great majority by the leading automotive photographer Simon Clay. The result is an enthralling and visually stunning study of the gorgeous, near faultless styling of V12 Ferraris over a period of some 40 years.